Playing pranks over friends is an absolutely amazing fun and the best of the way to do so, is to send anonymous text messages to them. Knowing one to all about them, You can easily bluff them by putting them in utter confusion to guess who you really are. Throughout the years since the mobile phone and the text Messages first launched, people have had been playing with friends by sending them SMS, pretending to be an unknown person. There are a couple of websites and Applications that allow you to do so, all free, all the way from your internet connection, however, when it comes to trusting these platforms, there are only a few to be relied on. 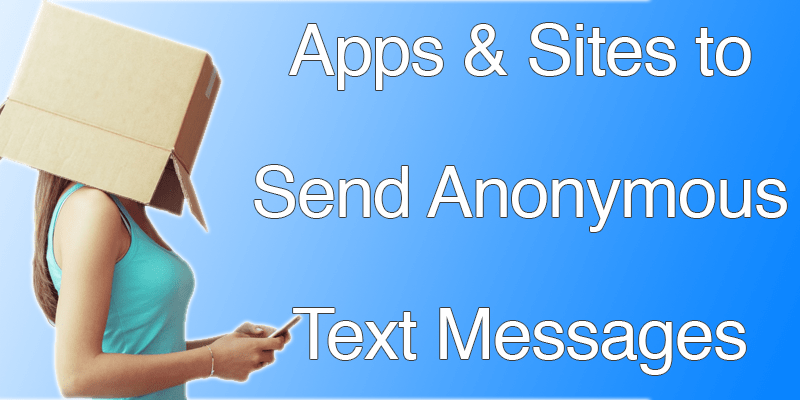 We have gathered a complete list of best applications and websites through which you can send anonymous text Messages to friends for fun, but before moving on to the actual list, please note that it is not advisable to use these platforms to hurt or insult someone or to abuse someone not in your good list. Let us first share the top best Applications that you should check out! There are some really cool applications that allow you to hide your identity and send text messages without disclosing who you are. It is through these Applications that you can send and receive messages all free. It would be a surprise if you do not know which application we are talking about as it one of the most popular messenger app that is widely used by the users. It lets you send messages without displaying your name as the sender. However, the limitation to this is that it can only allow 140 characters in one message. Adding more to the disadvantages, this application is only available for Android users, so in case you use, iPhone, you need to move on to the next Application. With this application, you can send jokes and messages to your friends and family and the identity of the sender remains completely hidden. Mustache works really well on tablets that do not support SIM cards and cannot be traced. It is important to state here that it only allows 5 messages free and then charges per SMS. Similar to the above shared ones, Burble is a good option of sending messages to the friends just for fun. It keeps your identity hidden and the best of all, it is faster and much cost effective. It is though not recommended by many reviewers as it can be used for mischief. Another similar application that will enable you to send prank messages without disclosing your identity is Yik Yak. It is faster and cheaper and provides complete security in not disclosing who you are. Now that we are done with few amazing applications to enjoy with friends, it is also to be noted that there are some decent website also that allow you to do anonymous texting all for free. Have a look down! Best Websites to Enjoy Anonymous Texting on! Smsti.in is a fabulous platform for sending unknown messages as the identity remains hidden and the best of all, you can even get to know whether the message has been received at the recipient end. However, there is only one limitation in this and that is, there are only 160 words that you can send in one message. Moreover, since it is an Indian Website, it only supports messages to be sent in India only. Seasms can also be a good choice while choosing an online platform for bluffing your friends. Unlike Smsti, the site lets you send the messages all over the world. It is fast and efficient too. Do you wish to send a huge message to the loved ones but do not have sufficient balance or want to prank your friends by writing a bit long text? Bollywoodmotion is a good option as it allows you to send a long text having 500 characters. The service is absolutely free and no ads appear in your message either. Another prominent name is of Foosms in the list. You can send 1 message in 24 hours for free to the world through this one. It is fast and secure but only lets you to send 140 characters. With this, the list comes to an end. Please do share your views.